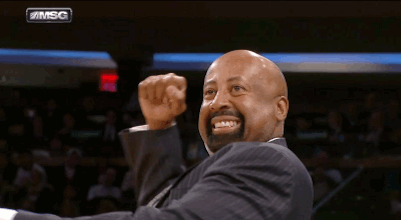 When the Knicks demoted GM Glen Grunwald last week, there were rumors that Mike Woodson’s job could be in danger. After all, Grunwald had been one of Woodson’s biggest supporters within the Knicks’ organization. However, it appears Coach Woodson is safe, for the time being. The Knicks announced Monday that they have picked up Woodson’s option for the 2014-2015 season, meaning that his contract— which would have expired following this coming season— is guaranteed for another year. Of course, the Knicks can always change their mind and fire Woodson if the team struggles this season. But this is true of every coach in the NBA… no contract can protect a Coach from being held responsible for a team’s results. But for now, all signs are indicating that The Beard will be here for the long run. This entry was posted in Articles and tagged KNICKS, knicks blog, knicks coach, knicks extend woodson, knicks fans, knicks hire coach, KNICKS MEMES, knicks mike woodson, knicks new gm, Knicks news, mike woodson beard, mike woodson contract, mike woodson contract extension, mike woodson extension, mike woodson option, mike woodson twitter, tommy rothman knicks on September 30, 2013 by Tommy Rothman.